Blue Wensleydale is creamy, mellow and smooth. Serve simply on a cheeseboard or use in recipes. Its full flavour, balanced with slices of sweet plum, makes a delicious stuffing for chicken breasts. This dish is perfect for a quick weekend treat for two. Using a sharp knife, cut each chicken breast almost in half along one long side. Open out flat and place between 2 sheets of clingfilm on a board. Bat each one with a rolling pin to flatten. Season the chicken breasts on both sides with salt and freshly ground black pepper. Halve and stone the plum, then cut each half into thin slices. 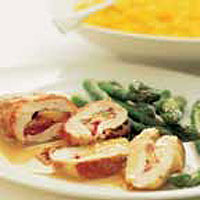 Thinly slice the cheese, then arrange the slices of plum and cheese over one half of each flattened chicken breast. Fold over the other half to enclose the filling, then wrap each one in two slices of Parma ham, pressing them securely to the chicken. Heat the oil and butter in a shallow pan with a lid. When it is hot and foaming, add the chicken and fry on both sides for about 5 minutes until the ham is crisp. Pour in the wine and bring to the boil. Reduce the heat and cover. Cook gently for 20-25 minutes, turning halfway through the cooking time, until the chicken is tender and thoroughly cooked and the juices run clear when pierced with a fork. Stir the crème fraîche into the pan, scraping up any sediment from the base of the pan. Taste and add more seasoning, if necessary. Serve the chicken with the sauce poured around on warmed plates with Riso Gallo Saffron Risotto Pronto Zafferano (saffron rice) and some steamed asparagus tips. If you want to make ahead, the chicken can be stuffed and wrapped in ham the day before you cook it. Cover it with clingfilm and store in the fridge.